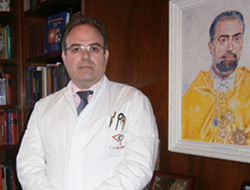 As president of the Associación ONG de Pacientes Hemianópsicos, he will answer your question altruistically. When you send an inquiry through the form or via email, Doctor Palomar will first send you a confirmation of receipt, if you do not receive it, check your information. If you want to contact with one of our centers, in Home you will find the address and the telephone number. In compliance with the LOPD (LO 15/1999 of December 13 on Protection of Personal Data, we inform you that your information will be part of a file called PROSPECCION, property of the CENTROS PALOMAR company, with domicile at the Ronda Sant Ramon, 88-08830 - Sant Boi de Llobregat. You have the right of access, rectification, cancellation and opposition that you can exercise by writing to the address indicated above. By now, it expressly authorizes us to send you information about the services and products of the company to the e-mail address provided.